Veteran construction industry pro points out three tips for framing carpenters that ensure quality, high-performance results. Matt Whitbeck, Co-Owner and President of Whitbeck Construction, LLC specializes in custom framing, exterior sustainability, and residential remodeling. He’s serious about quality craftsmanship and energy efficiency. So much so that he is a popular speaker at building industry conferences on those topics. Whitbeck and Kevin Ireton spoke to a standing room only crowd in the High-Performance Building Zone at NAHB’ International Builders Show (IBS). Whitbeck also took time following IBS to speak with Insulation Institute on three tips for framing carpenters as they work to help builders achieve more energy-efficient homes. 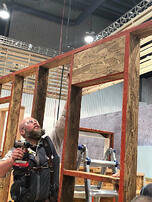 According to Whitbeck, the most common problem he sees in framing construction is too many studs. “That’s a huge violation because it leads to thermal bridging,” he said. Whitbeck instead advocates for advanced framing using 2-by-6 framing spaced 24 inches on center, which leaves more room in the cavity for insulation and with fewer framing members, leading to less thermal bridging. The approach also includes the use of single top plates, 2-stud corners with properly sized headers that should be filled with insulation, also to reduce thermal bridging. It’s more energy efficient, structurally sound and can reduce builders’ lumber costs. Whitbeck notes that builders and framing carpenters should explore advanced framing to determine if it makes sense for them, particularly with building energy codes changing across the country, necessitating new approaches to achieve more energy-efficient homes. High-performance building requires controlling for the flow of moisture, heat, and air within a building assembly, but too often, “little holes” in framing construction throughout the home are undermining performance. Avoiding the unintended holes is every contractor’s job. As we noted previously in our blog post, “Air Sealing, Whose Job Is It Anyway?” who fills unintended holes during construction depends on who drilled the hole. As a recommended practice, builders should specify within the scope of work for each contractor an “if you drill it, you fill it” approach to repairing unintended holes. Whitbeck believes that framers bear significant responsibility in a builder’s ability to deliver an energy-efficient home because they ultimately are the first contractors involved with the construction job and are largely responsible for building a structure that is free of unintended holes and is as air tight as possible. Being mindful of that responsibility and recognizing the importance of basic building science knowledge will go a long way to delivering the durability and performance builders and buyers want. Framers interested in learning the basics of building science can start with Insulation Institute’s Building Science 101, jointly published by Insulation Institute and Allison Bails at Energy Vanguard. The guide provides an overall understanding of the systems approach to building better homes that significantly improves building performance.